Hotel Bayerischer Hof has been family-owned for generations, “homeliness” is a tradition here: Feel at home here! Cosseted, spoilt with comfort and food, you soon forget about your day-to-day life. Whether it’s the Medieval castle or historical town square, you will love our hotel’s exceptional location! Sleep in comfortable rooms with stunning views over Burghausen’s town square or historic Burghausen Castle, which is the longest castle in the world at the same time. A leisurely breakfast after a comfortable night at our hotel sets you up for the day to experience Burghausen to the full with all its sights. For your information, all our tap water runs through a GRANDER® water revitalisation device. We look forward to you visiting us. Please use the contact form. below for family rooms and group enquiries. The fields marked with an asterisk* are mandatory fields. By submitting this form, I declare that I have read the data protection and I agree with it. I consent to the processing of my personal data as part of this contact. I am aware that I can revoke this consent at any time via the e-mail address. Traditional old Bavarian hospitality is harmoniously blended with typical Bavarian treats, grilled dishes and seasonal specialities here. In the dining rooms you will find space for up to 95 guests, including a side room for up to 35 people and a large beer garden in the middle of the historic town square. We will be happy to put together a quote for your event such as family celebrations, birthdays, weddings, Christmas parties, business dinners and club celebrations. We have special offers for groups and coach parties. We serve beers from the “Hacker Pschorr Brauerei München“, international wines, soft drinks and coffee. Regionalism and a personal relationship with our suppliers is important to us, in some cases we have been buying our products from the same supplier for several decades. Where else can you swim in a lake with a castle backdrop? Where else do cycle and hiking paths start right in the middle of town? Where does sport offer so much adventure: swimming in a competition stadium, football and tennis in an exemplary sports park, fishing or riding in unspoilt nature? Golfers find two stunning courses on offer, mini golfers have a picturesque course below Burghausen Castle. Anyone who doesn’t want to exert themselves, can take a boat trip with the Plätte or a bike ride, make use of the “culture on offer” or simply do whatever they fancy. Which is why we’re celebrating at the merry “Mai-Wies’n” festival. We’re going to come to the Burgfest again. But we might even be back a bit sooner . . . Highlights in the festival calendar: International Jazz Week, the Great Historic Castle Festival, Bridge Festival and the Castle Christmas. Owner: Peter Höcketstaller e. K.
1.2 The controller in charge for data processing on this website within the meaning of the General Data Protection Regulation (GDPR) is Hotel Bayerischer Hof Burghausen, Peter Höcketstaller e.K., Stadtplatz 45-46, 84489 Burghausen, Deutschland, Tel. 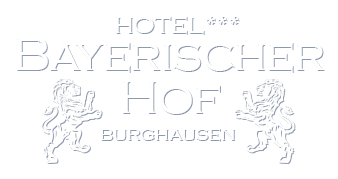 : +49 8677 9784 0, Fax: +49 8677 9784 40, E-Mail: info@bayerischer-hof-burghausen.de. The controller in charge of the processing of personal data is the natural or legal person who alone or jointly with others determines the purposes and means of the processing of personal data. We use the service “Cerber Security & Antispam”, which is offered by Cerber Tech Inc. New York, NY, 1732 1st Ave, 10128, USA. The plugin protects websites against brute force attacks, blocks harmful requests from IPs or subnets when a defined retry limit is exceeded. This makes brute-force attacks or distributed brute-force attacks of botnets impossible. Furthermore, it is possible to restrict, block, or allow access with a Black IP Access List and a White IP Access List. (More information about the features at: https://wpcerber.com/). According to the provider, no data is collected or processed in this context – neither through the services nor through the software offered. 5.1 On this website we also use the reCAPTCHA function of Google LLC, 1600 Amphitheatre Parkway, Mountain View, CA 94043, USA (“Google”). This function is mainly used to distinguish whether an entry is made by a natural person or misused by automatic and automated processing. The service includes the sending of the IP address and possibly other data required by Google for the reCAPTCHA service to Google and is carried out in accordance with Art. 6 (1) point f GDPR on the basis of our legitimate interest in determining the individual willingness of actions on the Internet and avoiding misuse and spam.